I was allowed to read an ARC of this book in exchange for an honest review. 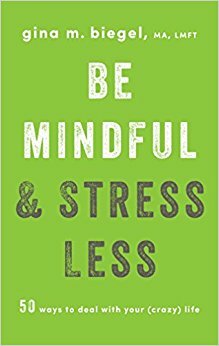 While looking through available ARCs this title with the word "mindful" caught my eye immediately. I'm a big believer in mindfulness even though it's something with which I struggle pretty much all the time so I was attracted to this book, thinking it might offer some new kind of tips that were going to blow my mind open and make mindfulness super easy to achieve. And since I've been clenching my teeth recently thanks to even more stressors than usual (thank you censorship at work and politics in general), the promise of less stress was equally appealing. Sign me up, please! The book is described as "accessible" and "user-friendly" and I can agree with that. There is no difficult jargon to grasp and the basics of mindfulness and Buddhism - impermanence, loving compassion - are introduced in an easy to grasp way. The ARC was less user-friendly thanks to formatting errors but no doubt that will all be fixed and columns will line up in the actual book. However, there were a few word clouds that I struggled to decipher in my copy. The information in the book is very helpful and presented in short chapters which would make it easy for someone to use almost as a daily affirmation-type book. In fact, I think that would be a better way to absorb the information in this book. Although the exercises are tried and true practices that help with caring for yourself and letting go of stress, nearly every chapter includes an acronym to help you remember the steps for that particular activity. Acronyms are great tools, but when there are twenty different ones, they lose their effectiveness. For me, at least. I'm not sure if I ought to be using HOT or ACORN or STOP or one of the others for each situation. If those could be condensed down to perhaps three, total, I think they would be much more effective for the reader. This book is clearly aimed at teens and some issues specific to teens rather than just a mindfulness book for the general population. Sprinkled in with information about self-care and treating yourself as you would a good friend, there was a mention of trying some other strategies rather than relieving stress in a self-harming way with some negative behavior examples. Those examples pulled me out of the book a little bit since they felt very specifically aimed at teens but as someone who works with teens, I can really appreciate that they were included. It's not a lecture about "here are some positive things to do rather than cutting yourself" but rather a subtle message about loving yourself without skirting around the issue. In the end, MY mind was not magically blown open as I was hoping, but I can always use a reminder of the principles I am trying to embody. This is a quick read that I think will be helpful to those teens who are open to trying the exercises within.